418 pages | 338 B/W Illus. 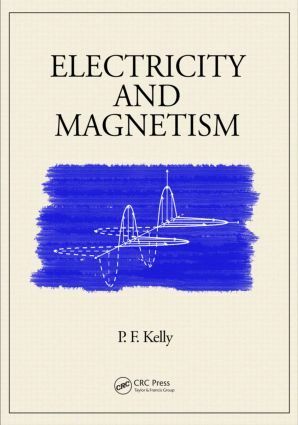 The final volume in a three-part series, Electricity and Magnetism provides a detailed exposition of classical electric and magnetic fields and analyses of linear electric circuits. The book applies the principles of classical mechanics to systematically reveal the laws governing observed electric and magnetic phenomena. The text culminates in Maxwell's Equations, which, although only four in number, can completely describe all physical aspects of electromagnetism. This text extends the rigorous calculus-based introduction to classical physics begun in Elements of Mechanics. It may be studied independently of the second volume, Properties of Materials. With more than four hundred and fifty problems included, it can serve as a primary textbook in an introductory physics course, as a student supplement, or as an exam review for graduate or professional studies. "This textbook is unique in many respects. It gives the reader a sense of being part of a lively and personal conversation about physics, engaging your attention from the first page. Advanced mathematical concepts are introduced as a prelude to further study while still maintaining the appropriate level for a first-year calculus-based course. But the most innovative feature of this text is the emphasis on thinking and reasoning about physics starting from basic principles. As a teacher, I often have the goal of developing critical analysis skills in my students; this textbook shows the way." "In this delightfully fresh take on the well-worn subject of classical Newtonian mechanics, Patrick Kelly adopts the informal approach of a classroom teacher, using a wealth of thoroughly worked examples to illustrate and develop the concepts introduced at each step of the journey on which his readers are taken. The journey actually covers a lot of ground. Starting from basic kinematical notions, such as average velocity, we are eventually led to appreciate ideas (for example, the fact that orbits under an inverse-square law of force are conic sections) that are quite sophisticated at this introductory level. Students faced with learning, more or less simultaneously, both basic physics and essential mathematical tools, such as calculus, will appreciate the deftness with which Kelly uses each set of ideas to illuminate the other. Readers will quickly warm to his engaging, and distinctively personal style, with its frequent flashes of humour, and will value the depth of understanding afforded both by the many sidelights he offers and by the alternative treatments he gives for many of the examples from complementary points of view. Those who work systematically through the text, and at least a selection of the 428 problems that supplement it, will gain not only the ability to tackle standard problems with confidence but also the sense that this territory is now home turf." P.F. Kelly is an associate professor of physics at Ave Maria University, Florida, USA. He previously held a faculty position at North Dakota State University, Fargo, USA. Prior to this, he undertook post-doctoral studies at the Center for Theoretical Physics, Massachusetts Institute of Technology, Cambridge, USA, and at the Winnipeg Institute for Theoretical Physics, University of Winnipeg, Manitoba, Canada. He holds a B.Sc from the University of Waterloo, Ontario, Canada, and an M.Sc and Ph.D from the University of Toronto, Ontario, Canada. His areas of interest include theoretical particle, gravitational, mathematical, and computational physics.